Main dish pies are the perfect fall and winter dinner idea. They're fun to make and delicious to eat, and with these tips and tricks you can even invent your own pie recipes! All pies are only as good as the pie crust. So take some time to read about Pie Crust 101 and choose the pastry recipe that you understand the best. Remember, you don't have to make a pie crust the traditional way, with cold fat cut into flour, then cold liquid added. I myself have had the most success with Hot Water Pastry, which is foolproof, especially when you roll the pastry out between two sheets of waxed paper. But you don't have to make a pie crust if you don't have time or aren't inclined to do so. There are plenty of prepared, refrigerated and frozen pie crust products on the grocer's shelves; just follow the package directions to make your own masterpiece. You can even use refrigerated biscuits, crescent rolls, and pizza crusts in place of pie crusts. There are two crust main dish pies, and single crust main dish pies. The single pie recipes are generally quiches (which real men do eat), that is, an egg and cheese custard baked in a crust. 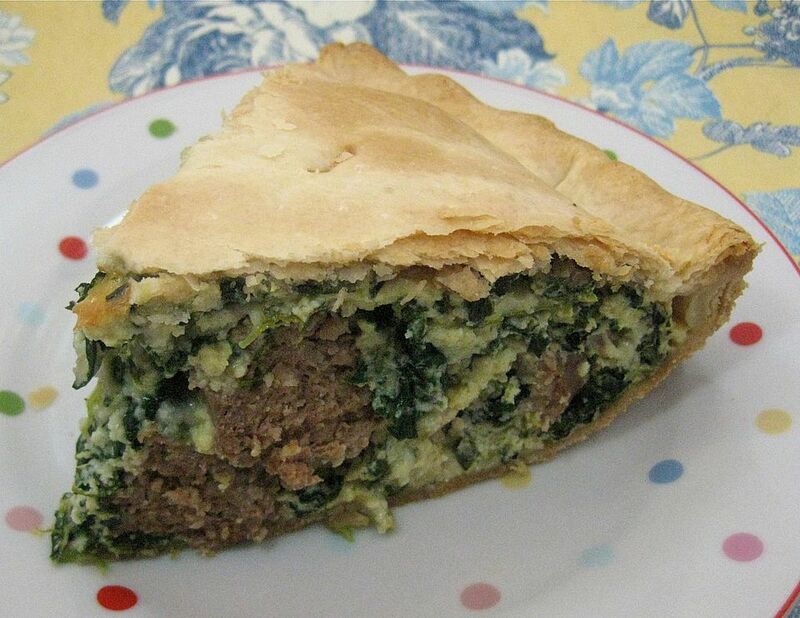 You can put just about any cooked meat or vegetable into the quiche base, making this an ideal way to use up leftovers. Two crust pies are sturdier, with a denser filling. And Pot Pies, which I discussed in a previous article, are hot fillings topped with a pie crust. We're dealing with single crust and two crust pies here. If you are a cook who likes to make food ahead of time, these pies can be frozen and then thawed overnight in the refrigerator and baked. Or they can be baked, cooled, and frozen, then thawed and reheated in the microwave oven. Or you can make a batch of pie crusts and freeze them. In the time it takes to thaw the crusts on the kitchen counter, you can get the filling together so dinner is ready in a matter of minutes. Enjoy these easy pies. Don't be intimidated - they are really very easy. And use your imagination to create your own pies using your favorite ingredients and flavors. Have fun! This is the basic French main dish pie that you can adapt to just about any meat, cheese, or vegetable combination. When I say easy, I mean easy. This fabulous recipe takes 5-10 minutes to put together, and it makes the fluffiest quiche ever. This pie is a bit more complicated; a white sauce gives the pie structure and makes for a meltingly tender filling. The flavors of pizza in a main dish pie! Your kids will love this rich and delicious recipe. Traditional flavors of ham and Swiss cheese combine in this easy and nutritious main dish pie. This is one of my favorite quiche recipes. Tender and nutty wild rice blends so well with the rich egg custard and tangy Swiss cheese in this wonderful pie. This homey recipe is real comfort food. You can make it using ingredients you probably already have in your fridge and pantry!